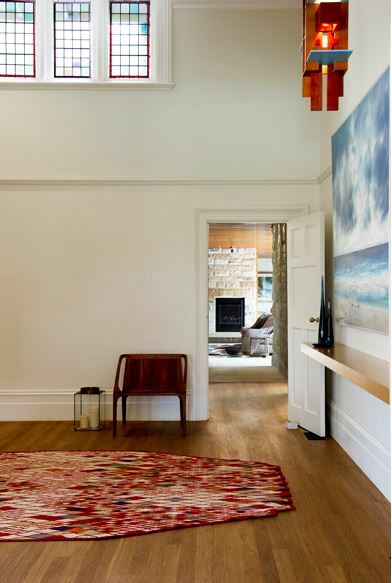 Cossington, the childhood home of Australian artist Grace Cossington Smith has been thoughtfully restored and renovated by architect Jorge Hrdina. The original home is locally listed and is located in a conservation area. 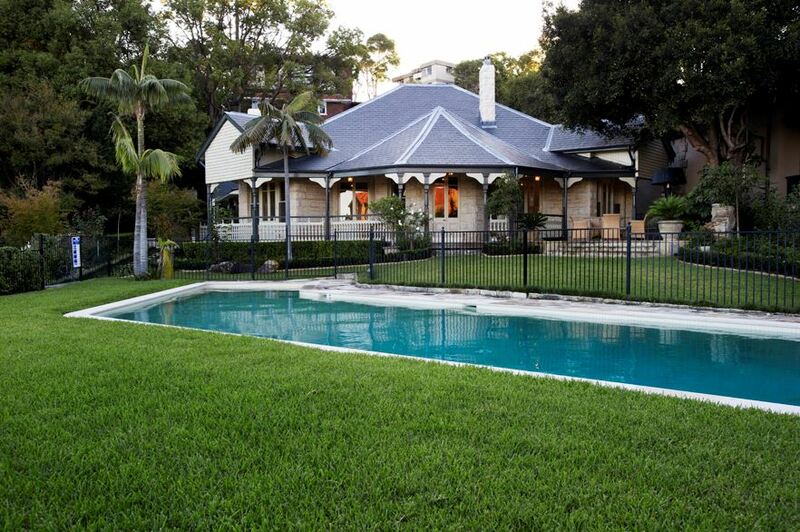 The significance of the house, located in Sydney’s north shore, relates to its historical associations with the Neutral Bay Company Land subdivision as well as the fact that it is representative of the architect Howard Joseland’s body of work. The house is a particularly fine example of a Queen Anne style federation house that has been modified over the years. It is also important for its association with the celebrated artist. 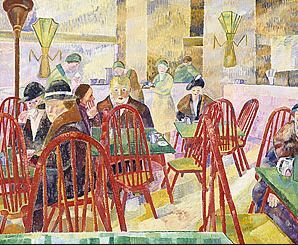 An early modernist, Cossington Smith is considered to have been one of the most innovative Australian artists of the 20th century. Her work is hung in every major gallery in Australia. Cossington was designed and built by Joseland in 1891 for Ernest August Smith a London born crown solicitor. Smith and his wife and family lived in the house from 1891 to 1900. Grace Cossington Smith, the second of five children, was born there on 20 April 1892. Her mother, Grace, nee Fisher, was the daughter of the rector and squire of Cossington, Leicestershire. It was at her request that the house was named Cossington. In 1901 the family sold the property, by then listed as 63 Wycombe Rd, and it has been since owned by a variety of different tenants. During the years 1916 to 1917 the property was sub-divided at the Wycombe Rd end. We imagine that this project was not an easy one. The original single storey sandstone house was in a poor condition and the restoration work required was substantial. The floorboards were completely replaced as 80 to 90% of the floor joists and bearers had rotted. The house had had extensive alterations to its original design and fabric both internally and externally. It did not face north and had small windows which meant Hrdina really needed to focus on bringing in light and developing a feeling of space. The existing house had had several alterations to the exterior elements and interior spaces. The most visible change had been the modification and extension of the veranda to increase its width and accordingly the gabled roof extensions to the side bay windows which gave an awkward appearance to the overall roof form. There was also a rear service wing including a garage and carport and first floor addition with two dormer windows. The northern elevation of the first floor addition had stone like cladding in poor condition and detracted from the overall character of the building. The original garden setting of the house had been modified due to subsequent subdivisions to the north and west portion of the original estate. A curved driveway leading to the rear garage along the southern boundary of the site provided access to the road at the north east corner of the site. The dwelling was obscured by dense vegetation and was not visible from the road. The house contained few of its original elements including floor layout, two fireplaces, some door and window joinery to the front sections, skirting to main rooms and servant room. None of the ceiling and cornices survive from the original phase. The main hall featured three arches in classical style with glazed panelled French doors providing access to the formal dining room. 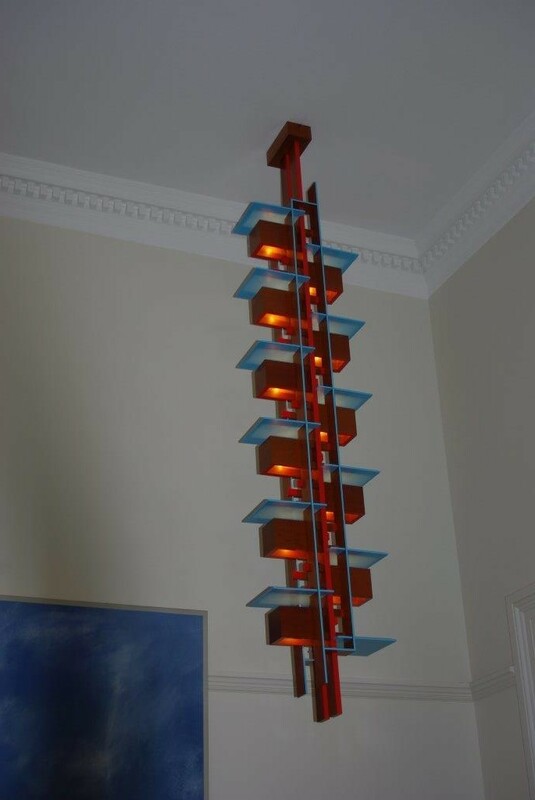 Now, as you walk in the main door you enter a large room very minimally furnished with a Frank Lloyd Wright light hanging off centre, it is really quite fabulous! The original house appears very open. The three arches have been removed. You walk right toward the dining and living room or left towards the modern addition. Hrdina has created an open plan layout within the main portion of the house by making additional openings between the principal rooms. He conserved the remaining original materials and details including the external sandstone walls and French door and window openings and the overall roof form. 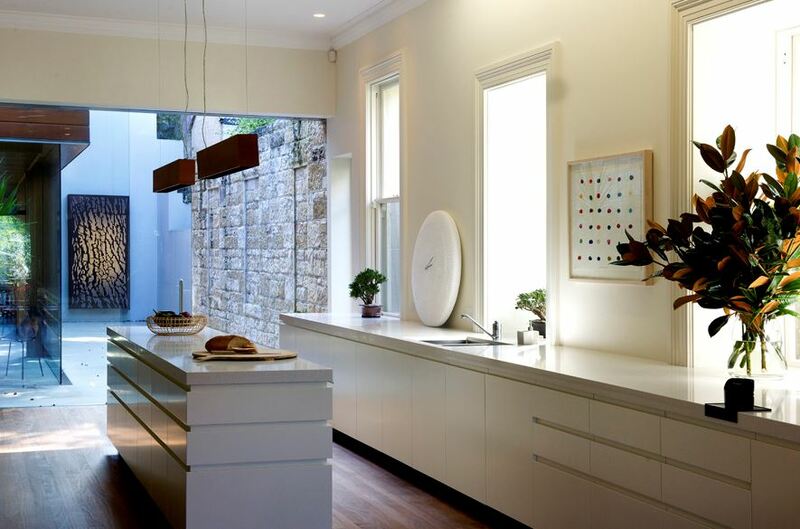 The kitchen can be accessed from the courtyard of the new addition and via the dining room. It is a very contemporary design and extends down the whole north side of the original house. 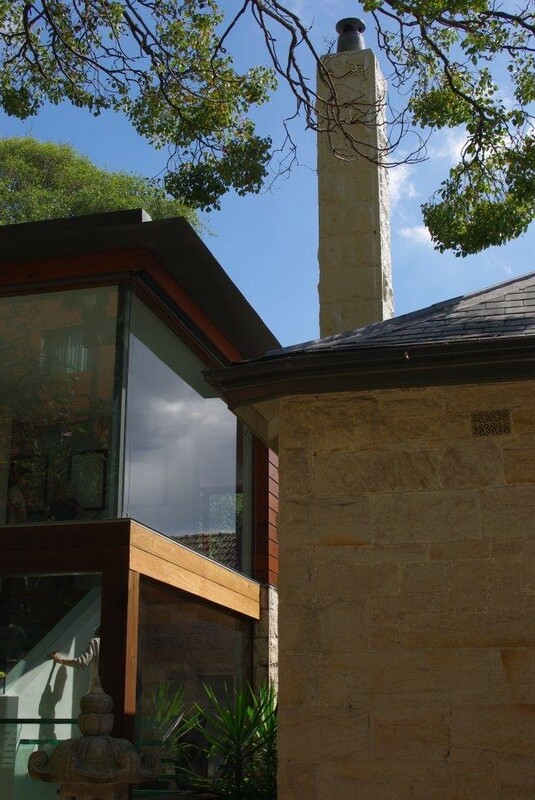 The existing rear service extension was demolished and in its place Hrdina erected a contemporary extension with a northern courtyard, lounge and guest bedroom with en-suite on the ground floor and three bedrooms, one with an en-suite and another bathroom, on the first floor. The addition retains a tenuous link with the main house and is described by the architect as being “divorced’ from it. The floorboards from the old house are extended part way down the hall into the new extension to provide a link. Hrdina talks about the contrast between grandeur in the old part and intimacy in the new. The new house has been opened up, with high ceiling adding to the feeling of grandeur, while the addition is cosier, ceilings are lower and have wood panelling. The new section while modern is sympathetic to the old. The materials for the new addition are contemporary but complementary to the existing materials. 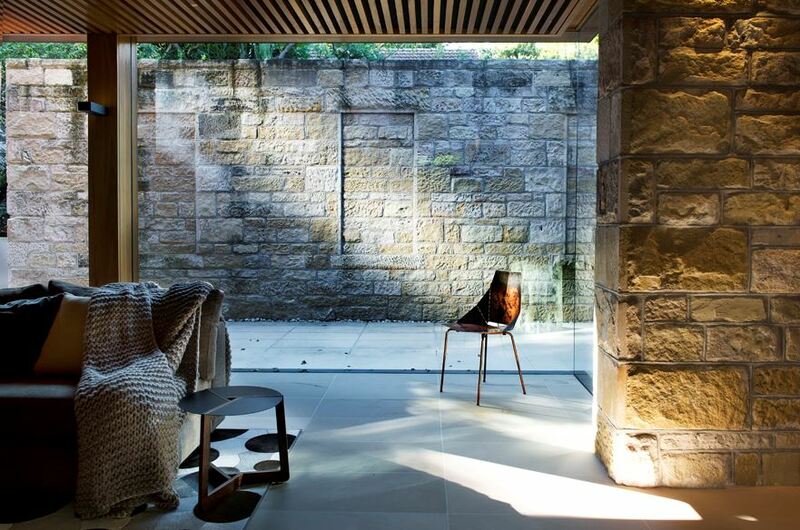 The architect has used a variety of finishes including recycled hen pecked sandstone, glass, tallowwood floors, timber cladding and timber joinery frames. The windows on the new addition are contemporary in form and proportion. The architect cleverly increased the feeling of curtilage, space and space by moving the garage underground at the front of house and returning the garden toward the street entrance. 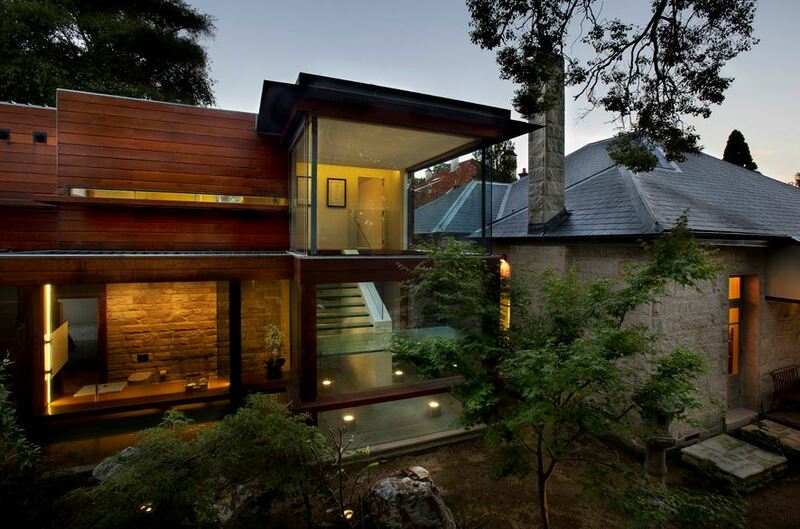 It is important for this style of house to retain its connection with nature. The existing stone wall of the rear wing has been re-used within the new addition as part of the landscaping of the site. The windows have been removed and where they once were sandstone has been added and recessed to interpret where they once existed. The house is located very close to the rear boundary which has a high retaining wall on the curved boundary alignment. 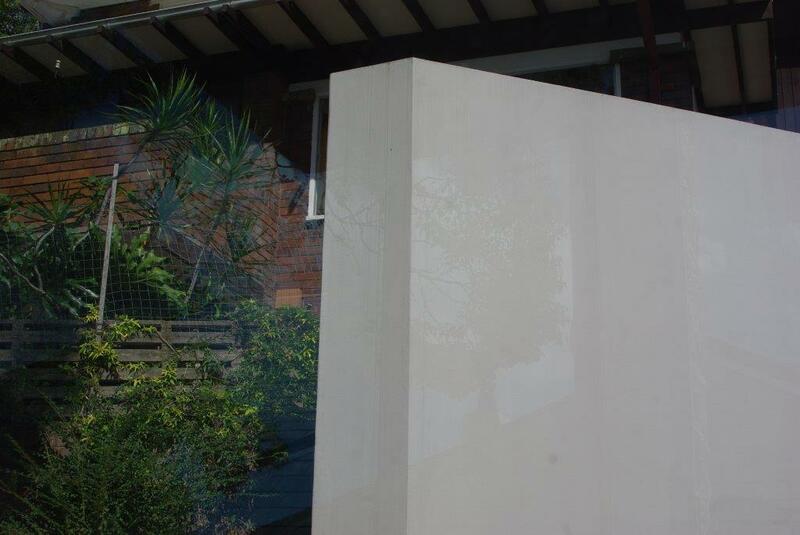 Hrdina has made a feature of the rounded retaining wall using off form concrete. The end result may appear to be a fairly radical solution to the problem of introducing natural light and a sense of space into an old heritage building, but we think it is a well-considered response. The architect has created a residence that meets the contemporary needs of its owners while retaining and preserving the surviving fabric and form of the dwelling. It has to be remembered that its authenticity had already been somewhat compromised. The addition is suitably recessed. It is lower than the main ridge dwelling of the original house and has a flat roof and cannot be seen from the front of the property. 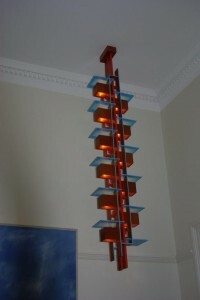 Hrdina has referred to the relationship between the artist and the house in small ways through his design. For example, in the kitchen he has strategically placed two red café chairs that pay homage to Cossington’s well-known work The Lacquer Room.